This Agreement constitutes the complete and entire understanding between GiveSendGo and you in connection with your use of this Website, content and software displayed on the Website, and hyperlinks to the Website. This Agreement supersedes any prior agreements, proposals, and or understandings between you and GiveSendGo, including but not limited to prior versions of the Agreement. The failure of GiveSendGo to exercise or enforce any right or provision of the Agreement shall not constitute a waiver of such right or provision. If any provision of the Agreement is found by a court of competent jurisdiction to be invalid, the parties nevertheless agree that the court should endeavor to give effect to the parties' intentions as reflected in the provision, and the other provisions of the Agreement remain in full force and effect. You agree that regardless of any statute or law to the contrary, any claim or cause of action arising out of or related to use of the Service or the Agreement must be filed within one (1) year after such claim or cause of action arose or be forever barred. These Terms and Conditions will be binding upon and will inure to the benefit of the parties, their successors and permitted assigns. GiveSendGo.com processes payment transactions through 3rd-party payment solutions such as Stripe, WePay and PayPal, among others. GiveSendGo is not a chartered banking entity. All funds that are not part of a fee paid to GiveSendGo.com are paid directly to 3rd-party payment solutions. You will not hold GiveSendGo liable or responsible for any funds or tax obligations on those funds paid to 3rd-party payment solutions. Givers and Campaign Owners agree not to involve GiveSendGo in any litigation that occurs due to using the website. GiveSendGo.com is owned by GiveSendGo LLC. GiveSendGo will not be held liable for any loss or damage due to failure to comply to the terms of this agreement. Electronic communications from GiveSendGo will be sent to Users to inform them of a variety of events that inform them about the state of their fund. You agree to allow GiveSendGo to send these communications to your email address. You also agree that GiveSendGo is not liable for any user generated content that is sent to you as a part of these communications. You agree that you are liable for any communications you send to potential Givers promoting your Campaign. These communications include, but are not limited to, "share" emails sent through the GiveSendGo.com website and communications sent outside of the GiveSendGo system. GiveSendGo reserves the right to delete Campaign Owner Campaigns at our discretion. 2) Use your GiveSendGo account for any illegal purposes. 3) Provide information that is not complete and accurate. 4) Attempt to bypass or otherwise circumvent the designated method of payment as provided by GiveSendGo. GiveSendGo has the right to, though will not be obligated to, in GiveSendGo’s sole discretion, to remove any content or block any individual or entity for any reason. GiveSendGo will have no obligation to provide a refund of any amounts previously paid. GiveSendGo does not and can not review all the material posted to the GiveSendGo.com system. By visiting GiveSendGo.com you are responsible for protecting yourself from content that is offensive or harmful that may have been posted on the website by another user. By visiting GiveSendGo.com you are responsible for protecting your equipment (computer, etc.) from any harm resulting from a visit to the website. As a GiveSendGo user, the online donation page you publish will be publicly available on the internet, for all to see, including search engines like Google and Yahoo. There are no private or hidden GiveSendGo donation pages. Your activity is public. GiveSendGo may attempt to verify your identity and other information you provided to us, and we may delay, withhold, reverse or refund any Contributions or other amounts without notice or liability in the event we are unable to verify any information to our satisfaction. (b) update this information so as to maintain its accuracy. You are solely responsible for maintaining the confidentiality of your password, username and all uses of your Campaign Account regardless of whether you have authorized such uses. You shall not share your account with anyone else. You agree not to use the account, username or password of anyone else. You shall not disclose your password to anyone else. All of your registration information must be accurate and truthful. You agree to notify GiveSendGo immediately if you discover that your User account has been used without your authorization or there has been any other breach of your User account's security. You also agree to provide additional information we may reasonably request and to answer truthfully and completely any questions we might ask you in order to verify your identity. Service: GiveSendGo.com the website and its functions. Campaign Owners: Those using the Service to raise funds. Users: Campaign Owners, Givers, and other visitors to the Service. Givers: An individual or entity that contributes to a fund or posts a comment to a fund. Contributions: Funds contributed by a Giver to Campaign Owners. 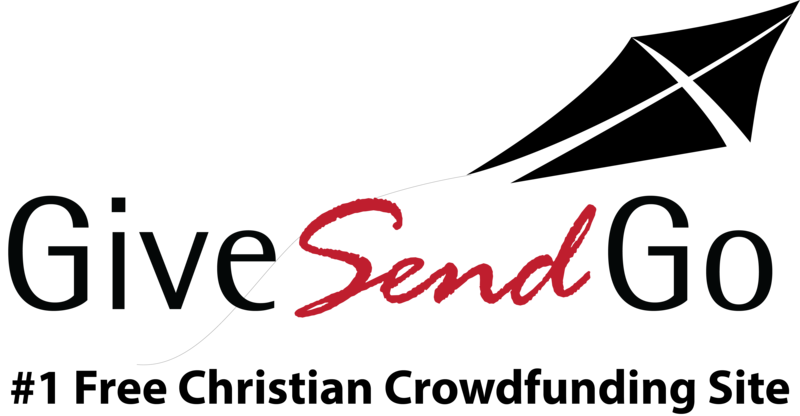 GiveSendGo is an online Christian fundraising/crowdfunding website that provides fundraising tools to Christian individuals and Christian non-profit organizations seeking to raise money for their own Campaigns and to contribute to the Campaigns of others. Campaign causes and projects can include: neighborhoods in need, memorial/funeral expenses, medical expenses, tuition assistance, adoption fundraising, funding for mission trips, and other Christian causes. Each Campaign Owner who creates an active account receives a personal fundraising profile page where they can share the mission God has given them, post photos and videos about their mission, as well as receive credit card contributions. Each Campaign allows Givers to donate money toward a specified goal, established by the Campaign Owner. Users use the Service at their own risk. You are not eligible to use the Service without consent if you are under 18 years of age, or the age of majority as that is defined in your jurisdiction, whichever is older. If you are between the ages of 13 and 17, you can use the Service with the consent and supervision of your parent or legal guardian who is at least 18 years old, provided that your parent or legal guardian also agrees to be bound by this Agreement, and agrees to be responsible for your use of the Service. By visiting GiveSendGo.com or accepting this Agreement, You represent and warrant to GiveSendGo that you have reached the age of majority in your jurisdiction, or that you are using this service under the supervision of your parent or legal guardian that has, and that You or your Parent or legal guardian have the right, authority and capacity to agree to and abide by these Terms. You also represent and warrant to GiveSendGo that you will use GiveSendGo.com in a manner consistent with any and all applicable laws and regulations. You are not eligible to use the Service if you have previously been suspended from using the Service for any reason and we have not explicitly authorized you to resume using the Service. We reserve the right to refuse use of the Service to anyone and to reject, cancel, interrupt, remove or suspend a Campaign at any time for any reason without liability. We do not engage in any solicitation activities; such activities are carried out by our users on their own initiative. If your agency has any concerns that a law is being violated by our users, please report it to us immediately and we will work to address your concern. (b) You will comply with all relevant local, state, and federal laws applicable to you when you solicit funds, particularly but not limited to the laws relating to your marketing and solicitation for your project. Nothing contained in the Terms or the Service constitutes legal advice. If you have any questions regarding your legal rights and legal obligations, you should consult with your own attorney. You may not use the GiveSendGo service for activities that violate any law, statute, ordinance or regulation related to: (a) narcotics, steroids, certain controlled substances or other products that present a risk to consumer safety, (b) drug paraphernalia, (c) items that encourage, promote, facilitate or instruct others to engage in illegal activity, (d) items that promote hate, violence, racial intolerance, or the financial exploitation of a crime, (e) items that are considered obscene, (f) items that infringe or violate any copyright, trademark, right of publicity or privacy or any other proprietary right under the laws of any jurisdiction, (g) certain sexually oriented materials or services, or (h) ammunition, firearms, or certain firearm parts or accessories, or (i) certain weapons or knives. You may not use the GiveSendGo service for activities that violate any law, statute, ordinance or regulation related to transactions that: (a) show the personal information of third parties in violation of applicable law, (b) support pyramid or ponzi schemes, matrix programs, other "get rich quick" schemes or certain multi-level marketing programs, (c) are associated with purchases of real property, annuities, investments, equity or lottery contracts, lay-away systems, off-shore banking or transactions to finance or refinance debts funded by a credit card, (d) are for the sale of certain items before the seller has control or possession of the item, (e) are by payment processors to collect payments on behalf of merchants, (f), are associated with the following Money Service Business activities: the sale of traveler's checks or money orders, currency exchanges or check cashing, or (g) provide certain credit repair or debt settlement services involve the sales of products or services identified by government agencies to have a high likelihood of being fraudulent. You may not use the GiveSendGo service for activities that violate any law, statute, ordinance or regulation related to: involve gambling, gaming and/or any other activity with an entry fee and a prize, including, but not limited to casino games, sports betting, horse or greyhound racing, lottery tickets, other ventures that facilitate gambling, games of skill (whether or not it is legally defined as a lottery) and sweepstakes unless the operator has obtained prior approval from GiveSendGo and the operator and customers are located exclusively in jurisdictions where such activities are permitted by law. Campaign Owners are not permitted to create a Campaign to raise funds for illegal activities, to cause harm to people or property, or to scam others. If you know that your Campaign is claiming to do the impossible or it's just plain phony, don't post it. You must comply with all applicable laws and regulations in carrying out your Campaign. It is our desire to give Campaign Owners every option in creating incentives for Givers to give to Campaigns. Unfortunately Campaign Owners are not permitted to offer or provide any perks at this time. take any action that imposes, in GiveSendGo’s sole discretion, an unreasonable load on our infrastructure. We reserve the right to remove Campaigns and terminate User accounts for such activities. (a) GiveSendGo’s Ownership Rights. GiveSendGo and its licensors own all right, title and interest, including without limitation all worldwide intellectual property rights in GiveSendGo’s Products and Services, and all such rights to all derivative works or enhancements of, in and to, or relating to, the GiveSendGo Products and Services. By entering into this Agreement or by Your participation, You will not acquire any intellectual property or similar rights in the GiveSendGo Products and Services other than a limited right to use the Products and Services for Your personal benefit. You agree You will not (i) remove, alter or conceal any copyright, trademark, service mark or other proprietary rights notices incorporated in or accompanying the GiveSendGo Products and services; or (ii) use GiveSendGo’s name, logo, trademark, trade names or service marks except as expressly permitted in this Agreement without GiveSendGo’s prior written consent. (b) Your Ownership Rights. Subject to the licenses granted in this Agreement, You retain all right, title and interest, including without limitation all worldwide intellectual property rights, in and to Your Content that is submitted, posted or displayed by You on or through GiveSendGo.com. By posting or providing Content You grant GiveSendGo an unlimited, worldwide, non-exclusive right and license to use, display, distribute, copy, share, modify and create derivative works of Your content without further compensation or payment. GiveSendGo shall not acquire any right, title or interest in or to such Content, except as provided herein. Any rights not granted by You herein are deemed retained by You. You represent and warrant that your User Content and our use of your User Content will not infringe any third party's intellectual property rights, proprietary rights, privacy rights, confidentiality, rights of publicity or otherwise violate these Terms or applicable law. You agree that You shall not create or distribute information, including but not limited to advertisements, press releases or other marketing materials, or include links to any sites which offer such information, (I) containing or suggesting an endorsement by GiveSendGo of You or Your Content; or (ii) relating to this Agreement, without the prior review and written approval of GiveSendGo. Notwithstanding the foregoing, You may accurately disclose and describe Your Participation and Your Content (for example, describing and promoting Your Content on Your blog, social media sites, or in emails). You understand that all fundraising campaigns, messages, text, files, images, photos, video, sounds, or other materials ("Content") posted on, transmitted through, or linked from the Service, are the sole responsibility of the person from whom such Content originated. More specifically, you are entirely responsible for each individual item ("Item") of Content that you post, email or otherwise make available via the Service. As more fully described in ("Termination"), You have the right to terminate this Agreement and revoke certain licenses You are granting in this Agreement, with respect to Content You provide. If You choose to revoke in writing any of Your revocable licenses, GiveSendGo will use commercially reasonable efforts to remove Your Content from the GiveSendGo Site reasonably upon receipt of Your written notice of revocation. You acknowledge that You are aware that GiveSendGo has limited practical ability to control or monitor possible infringement of Your intellectual property rights by other parties and that GiveSendGo assumes no responsibility for controlling or monitoring such intellectual property rights. In addition, GiveSendGo is not responsible for enforcing Your intellectual property or for suing or taking other legal action against infringers. You or a third party licensor, as appropriate, are responsible for protecting Your intellectual property rights. (c) GiveSendGo’s Trademark License to You. During the term of this Agreement, and subject to Your compliance with the terms and conditions of this Agreement, You will have the right to use the trade names, trademarks, logos and designations in or associated with GiveSendGo solely for purposes of identifying GiveSendGo and solely in connection with Your permitted activities under this Agreement. You agree that the GiveSendGo Marks and all associated goodwill are and will remain the sole property of GiveSendGo, that any goodwill generated as a result of Your licensed use of GiveSendGo Marks belongs exclusively to GiveSendGo and inures solely to the benefit of GiveSendGo, and that Your use of GiveSendGo Marks is subject to GiveSendGo’s control of the quality of any products or services with respect to which You may be authorized to use GiveSendGo Marks. We grant you a limited, non-exclusive, non-transferable, revocable license to use the Service subject to your eligibility and your continued compliance with these Terms. Consistent with our culture of open innovation, we are always pleased to hear from our user community and welcome comments or suggestions to improve our products and services. However, to avoid future misunderstandings when new products, services and features developed internally by GiveSendGo employees might be similar or even identical to a submission received by GiveSendGo, the following GiveSendGo policy applies to all third party submissions to GiveSendGo of ideas, comments, suggestions, proposals or materials: (a) all submissions shall be considered non-confidential and non-proprietary; (b) we will have no obligation concerning the submission, contractual or otherwise (including, without limitation, confidentiality); (c) we will not be liable for any use or disclosure of any submission; and (d) GiveSendGo shall be entitled to unrestricted use of the submission for any purpose whatsoever, commercial or otherwise, without compensation to the submitting person. If the DMCA notice is properly formed, we will act quickly to take down the complained-about material and request a response from the person responsible for posting it. Please note that sending a false DMCA notice is not only a criminal act, but also enables the victim of the notice to sue you. The contents of GiveSendGo.com, and of all other Web sites under GiveSendGo’s control, whether partial or otherwise such as text, graphics, images, logos, button icons, sounds, video, software and other GiveSendGo content, are protected under both United States and foreign copyright, trademark and other laws. All GiveSendGo Content is the property of GiveSendGo L.L.C. or its content suppliers or clients. The compilation (meaning the collection, arrangement and assembly) of all content on the GiveSendGo website is the exclusive property of GiveSendGo and is protected by United States and foreign copyright, trademark, and other laws. Unauthorized use of the GiveSendGo.com Content may violate these laws, and is strictly prohibited. You may use the Site and its content and materials only for the purposes stated in this Agreement. You may copy such content for your own personal, non-commercial use only, or as otherwise provided herein, provided you do not alter it or remove any copyright, trademark or other proprietary notice. As a Giver to a GiveSendGo online campaign page you have the option to publicly display your donation for all to see, including search engines like Google and Yahoo. To hide your Contribution, including your name, comment and/or Facebook photo from others visitor and search engines alike, simply click the 'Anonymous' checkbox during the donation process. As a Giver, you are solely responsible for asking questions and investigating Campaigns to the extent you feel is necessary before you make a Contribution. All Contributions are made voluntarily and at your sole discretion and risk. GiveSendGo doesn't guarantee that Contributions will be used as promised or that the Campaign will achieve its goals. GiveSendGo does not endorse, guarantee, make representations, or provide warranties for or about the quality, safety, morality or legality of any Campaign, or Contribution, or the truth or accuracy of content posted on the Service. You are solely responsible for determining how to treat your Contribution for tax purposes. Givers and Stripe Campaign owners also both agree that in the event funds that have been donated by a Giver to a Stripe processed campaign and are not requested for transfer to the Campaign owners account or requested for refund by the Giver with 1 year of donation, then those amounts will be available for dispursement to GiveSendGo LLC bank account for operating expenses. GiveSendGo serves as a funding platform for Givers and Campaign Owners. If a Campaign is found to be in violation of the terms of this Agreement, GiveSendGo reserves the right to terminate the Campaign Owners account or the Campaign Owners campaign(s). GiveSendGo does not warrant that funds will be used for any particular purpose and is not responsible for any misuse of the funds by the Campaign Owner or the intended beneficiary. In addition, donations made on GiveSendGo.com are non-refundable. All further dealings following a contribution are solely between Givers and Campaign Owner or the intended beneficiary. GiveSendGo can serve as an intermediary between Givers and Campaign Owners, but is under no obligation to become involved in disputes between Campaign Owners and Contributors, or Users and any third party. In the event of any dispute, such as a Campaign Owner's alleged failure to comply with the Terms or alleged failure in completing a Campaign, we may provide the Campaign Owner's contact information to the Giver so that the two parties may resolve their dispute. If a Campaign Owner is found to be in violation of the terms of this Agreement, GiveSendGo also reserves the right to terminate the Campaign Owners account(s). GiveSendGo does not warrant that funds will be used for any particular purpose and is not responsible for any misuse of the funds by the Campaign Owner or the intended beneficiary. In addition, donations made on GiveSendGo are non-refundable. All further dealings following a contribution are solely between Giver and Campaign Owner or the intended beneficiary. GiveSendGo does not charge any mandatory fees! We are a FREE service!! We do provide an opportunity for the Giver and the Goer to donate to Givesendgo, allowing us to continue providing our free service. The service works with Stripe in the USA and Internationally to ensure that all donations go directly to you automatically and immediately. Setting up an account on the Service is free. We do not charge fees to Givers, or to the Campaign Owners. By using the Service you agree to our fees listed here http://givesendgo.com/pricing-fees. Changes to fees are effective after we post notice of the changes on the Service. Updated fees are applied to Campaigns launched after the notice is posted. You are responsible for paying all taxes associated with your use of the Service. Contributions are usually made via credit card through Stripe. We are not responsible for the performance of Stripe or any 3rd party credit card processing services. US and Canada Users ONLY: Stripe charges a fee of 2.9% AND $0.30 per transaction. Read Stripes Terms & Conditions. UK Users ONLY: Stripe charges a fee of 2.4% AND 20p per transaction. Read Stripe's Terms & Conditions. International Users ONLY: Stripe will charge 2.9% AND $0.30 per transaction. Read Stripe's Terms & Conditions. All fees are deducted from each transaction automatically so you're never billed for anything. GiveSendGo is not the same company as Stripe and their fees and commissions are subject to change without notice from us. Payment processing services for Campaign Owners on GiveSendGo.com are provided by Stripe and are subject to the Stripe Connected Account Agreement, which includes the Stripe Terms of Service(collectively, the “Stripe Services Agreement”). By agreeing to this agreement / these terms or continuing to operate as a Campaign Owner on GiveSendGo, you agree to be bound by the Stripe Services Agreement, as the same may be modified by Stripe from time to time. As a condition of GiveSendGo enabling payment processing services through Stripe, you agree to provide GiveSendGo accurate and complete information about you and your business, and you authorize GIveSendGo to share it and transaction information related to your use of the payment processing services provided by Stripe. GiveSendGo makes no guarantees regarding any aspect our third party payment processor's decision to transact donations between the campaign creator and the Giver. Additionally, GiveSendGo does not guarantee full receipt of the pledged amount because it does not control the financial transaction. GiveSendGo is the only party that can initiate refunds, and it is at their own discretion to do so. GiveSendGo is not responsible for refunding any funds collected by the Campaign Owner through the use of GiveSendGo.com or by any other means. If monies are refunded by the Campaign Owners in error no monies will be returned until after a period of 45 days. Contributions, along with our fees and charges, are not refundable. If GiveSendGo should receive notification from its third party payment processor(s) of an unauthorized payment/Chargeback made to Campaign Owners, the Campaign Owner will be obliged to immediately (upon notification by GiveSendGo) return the disputed funds until the investigation is completed. Any fees associated with chargebacks by Givers will be charged to the Campaign Owner. GiveSendGo reserves the right to cancel, suspend or disable a campaign for any reason at any time. Your taxing authorities may classify funds you raise on GiveSendGo as taxable income to you and any beneficiary who will receive funds directly from your Campaign. We encourage you to consult with a licensed tax advisor from your local jurisdiction when planning your Campaign so that you understand and prepare for the tax obligations you may incur from the funds you raise. The GiveSendGo.com website and Content available through the Service may contain features and functionalities that may link you or provide you with access to third party content which is completely independent of GiveSendGo, including web sites, directories, servers, networks, systems, information and databases, applications, software, programs, products or services, and the Internet as a whole. Your interactions with organizations and/or individuals found on or through the Service, including payment and delivery of goods or services, and any other terms, conditions, warranties or representations associated with such dealings, are solely between you and such organizations and/or individuals. You should make whatever investigation you feel necessary or appropriate before proceeding with any online or offline transaction with any of these third parties. GiveSendGo and certain other GiveSendGo Sites contain links to social media sites, including but not limited to authentication modules and fundraising modules. These links are provided solely as a convenience to You and not as an endorsement by GiveSendGo of the content on such social media sites. GiveSendGo is not responsible for the content, accuracy of such content, or manner in which such content is provided to these third party social media sites. You specifically agree that the use of these social media sites in conjunction with GiveSendGo is at your own risk. You agree that GiveSendGo shall not be responsible or liable for any loss or damage of any sort incurred as the result of any dealings with third party sites or vendors. If there is a dispute between participants on this site, or between users and any third party, you understand and agree that GiveSendGo is under no obligation to become involved. In the event that you have a dispute with one or more other users, you hereby release GiveSendGo, its officers, employees, agents and successors in rights from claims, demands and damages (actual and consequential) of every kind or nature, known or unknown, suspected and unsuspected, disclosed and undisclosed, arising out of or in any way related to such disputes and / or our service. If you are a California resident, you waive California Civil Code Section 1542, which says: "A general release does not extend to claims which the creditor does not know or suspect to exist in his favor at the time of executing the release, which, if known by him must have materially affected his settlement with the debtor." If you are a Campaign Owner that accepts Stripe or a Giver that uses Stripe, you agree to comply with the Stripe Acceptable Use Policy. (6) involve gambling, gaming and/or any other activity with an entry fee and a prize, including, but not limited to casino games, sports betting, horse or greyhound racing, lottery tickets, other ventures that facilitate gambling, games of skill (whether or not it is legally defined as a lottery) and sweepstakes unless the operator has obtained prior approval from the payment processor and the operator and customers are located exclusively in jurisdictions where such activities are permitted by law. (f) your use does not overburden GiveSendGo’s systems. GiveSendGo reserves all rights in the content of the RSS feeds and may terminate any RSS feed at any time. Use of the Service beyond the scope of authorized access granted to you by GiveSendGo immediately terminates said permission or license. In order to collect, aggregate, copy, duplicate, display or make derivative use of the Service or any Content made available via the Service for other purposes (including commercial purposes) not stated herein, you must first obtain a license from GiveSendGo. You acknowledge that GiveSendGo may establish limits concerning use of the Service, including the maximum number of days that Content will be retained by the Service, the maximum number and size of postings, email messages, or other Content that maybe transmitted or stored by the Service, and the frequency with which you may access the Service. You agree that GiveSendGo has no responsibility or liability for the deletion or failure to store any Content maintained or transmitted by the Service. You acknowledge that GiveSendGo reserves the right at any time to modify or discontinue the Service (or any part thereof) with or without notice, and that GiveSendGo shall not be liable to you or to any third party for any modification, suspension or discontinuance of the Service. This Agreement, and any rights and licenses granted hereunder, may not be transferred or assigned by you, but may be assigned by GiveSendGo without restriction or consent. You agree that GiveSendGo, in its sole discretion, has the right (but not the obligation) to delete or deactivate your account, block your email or IP address, or otherwise terminate your access to or use of the Service (or any part thereof), immediately and without notice, and remove and discard any Content within the Service, for any reason, including, without limitation, if GiveSendGo believes that you have acted inconsistently with the letter or spirit of the Agreement. Further, you agree that GiveSendGo shall not be liable to you or any third-party for any termination of your access to the Service. Further, you agree not to attempt to use the Service after said termination. GiveSendGo has no fiduciary duty to you. THE SERVICE IS PROVIDED ON AN "AS IS" AND "AS AVAILABLE" BASIS WITHOUT ANY WARRANTIES, EXPRESS OR IMPLIED, INCLUDING, WITHOUT LIMITATION, IMPLIED WARRANTIES OF MERCHANTABILITY OR FITNESS FOR A PARTICULAR PURPOSE, NONINFRINGEMENT OR COURSE OF PERFORMANCE ARE EXPRESSLY DISCLAIMED TO THE FULLEST EXTENT PERMITTED BY LAW. YOU AGREE THAT USE OF THE GIVESENDGO SITE AND THE SERVICE IS ENTIRELY AT YOUR OWN RISK. GIVESENDGO DISCLAIMS ANY WARRANTIES FOR OTHER SERVICES OR GOODS RECEIVED THROUGH OR ADVERTISED ON THE GIVESENDGO SITE OR THE SITES OR SERVICE, OR ACCESSED THROUGH ANY LINKS ON THE GIVESENDGO SITE. TO THE FULLEST EXTENT PERMITTED BY LAW, GIVESENDGO DISCLAIMS ANY WARRANTIES FOR VIRUSES OR OTHER HARMFUL COMPONENTS IN CONNECTION WITH THE GIVESENDGO SITE OR THE SERVICE. SOME JURISDICTIONS DO NOT ALLOW THE DISCLAIMER OF IMPLIED WARRANTIES. IN SUCH JURISDICTIONS, SOME OF THE FOREGOING DISCLAIMERS MAY NOT APPLY TO YOU INSOFAR AS THEY RELATE TO IMPLIED WARRANTIES. GIVESENDGO (INCLUDING ITS AFFILIATES, DIRECTORS, OFFICERS, EMPLOYEES, AGENTS, SUBCONTRACTORS OR LICENSORS) IS NOT LIABLE FOR ANY INDIRECT, PUNITIVE, INCIDENTAL, SPECIAL, CONSEQUENTIAL OR EXEMPLARY DAMAGES OR, IN ANY EVENT, FOR DAMAGES EXCEEDING THE LESSER OF ONE HUNDRED U.S. DOLLARS ($100.00) OR THE FEES YOU PAID TO GIVESENDGO FOR THE TRANSACTION FROM WHICH THE CAUSE OF ACTION AROSE. THIS LIMITATION OF LIABILITY SECTION APPLIES WHETHER THE ALLEGED LIABILITY IS BASED ON CONTRACT, TORT, NEGLIGENCE, STRICT LIABILITY, OR ANY OTHER BASIS, EVEN IF GIVESENDGO HAS BEEN ADVISED OF THE POSSIBILITY OF SUCH DAMAGE AND TO THE FULLEST EXTENT PERMITTED BY LAW IN THE APPLICABLE JURISDICTION. For jurisdictions that do not allow us to limit our liability: Notwithstanding any provision of this Agreement, if your jurisdiction has provisions specific to waiver or liability that conflict with the foregoing, then our liability is limited to the smallest extent possible by law. Specifically, in those jurisdictions not allowed, we do not disclaim liability for: (a) death or personal injury caused by our negligence or that of any of its officers, employees or agents; or (b) fraudulent misrepresentation or intentional misconduct; or (c) any liability which it is not lawful to exclude either now or in the future. You agree that: (i) the Service shall be deemed solely based in Delaware (where we have our headquarters); and (ii) the Service shall be deemed a passive one that does not give rise to personal jurisdiction over GiveSendGo, either specific or general, in jurisdictions other than Delaware. Any dispute arising from or relating to these Terms and Conditions or our provision of services to you must be resolved in a court of competent jurisdiction in the State of Delaware. If you fail to bring a dispute in compliance with these "Forum of Dispute" provisions, we may make a motion to dismiss your claim, which you must consent to, and you will be responsible for all of our reasonable attorneys' fees, costs, and disbursements involved in making such a motion. Additionally, the successful party in any dispute will be entitled to receive from the unsuccessful party all of its reasonable attorneys' fees, cost, and disbursements. The arbitration will be conducted by the American Arbitration Association (AAA) under its rules, including the AAA's Supplementary Procedures for Consumer-Related Disputes. The AAA's rules are available at www.adr.org or by calling 1-800-778-7879. Payment of all filing, administration and arbitrator fees will be governed by the AAA's rules. We will reimburse those fees for claims totaling less than $10,000 unless the arbitrator determines the claims are frivolous. You may choose to have the arbitration conducted by telephone, based on written submissions, or in person in the county where you live or at another mutually agreed location. We each agree that any dispute resolution proceedings will be conducted only on an individual basis and not in a class, consolidated or representative action. If for any reason a claim proceeds in court rather than in arbitration we each waive any right to a jury trial. We also both agree that you or we may bring suit in court to enjoin infringement or other misuse of intellectual property rights. If for any reason, a claim proceeds in court rather than in arbitration, the dispute shall be exclusively brought in a court of competent jurisdiction located in the Delmar and County of Sussex, Delaware. Subject to the arbitration provisions set forth above, the successful party in any dispute will be entitled to receive from the unsuccessful party all of its reasonable attorneys’ fees, cost, and disbursements. If you are a resident in a jurisdiction that requires a specific statement regarding waiver and release then the following applies. For example, California residents must, as a condition of this Agreement, waive the applicability of California Civil Code Section 1542 for unknown claims which states: "A GENERAL RELEASE DOES NOT EXTEND TO CLAIMS WHICH THE CREDITOR DOES NOT KNOW OR SUSPECT TO EXIST IN HIS OR HER FAVOR AT THE TIME OF EXECUTING THE RELEASE, WHICH IF KNOWN BY HIM OR HER MUST HAVE MATERIALLY AFFECTED HIS OR HER SETTLEMENT WITH THE DEBTOR." You hereby waive this section of the California Civil Code and any similar provision in law, regulation or code that has the same effect or intent as the foregoing release. Please report any violations of the Agreement, by flagging the posting(s) for review, or by emailing to: Compliance@GiveSendGo.com. Our failure to act with respect to a breach by you or others does not waive our right to act with respect to subsequent or similar breaches. You understand and agree that, because damages are often difficult to quantify, if it becomes necessary for GiveSendGo to pursue legal action to enforce the Agreement, you will be liable to pay GiveSendGo the following amounts as liquidated damages, which you accept as reasonable estimates of GiveSendGo’s damages for the specified breaches of the Agreement: If you post a message that (1) impersonates any person or entity; (2) falsely states or otherwise misrepresents your affiliation with a person or entity; or (3) that includes personal or identifying information about another person without that person's explicit consent, you agree to pay GiveSendGo one thousand dollars ($1,000) for each such message, plus attorneys fees and costs. If you post Content in violation of the Agreement, other than as described above, you agree to pay GiveSendGo one hundred dollars ($100) for each Item of Content posted, plus attorneys fees and costs. If you aggregate, display, copy, duplicate, reproduce, or otherwise exploit for any purpose any Content (except for your own Content) in violation of the Agreement without GiveSendGo’s express written permission, you agree to pay GiveSendGo three thousand dollars ($3,000), plus attorneys fees and costs, for each day on which you engage in such conduct. Otherwise, you agree to pay GiveSendGo’s actual damages plus attorneys fees and costs, to the extent such actual damages can be reasonably calculated. Notwithstanding any other provision of the Agreement, GiveSendGo retains the right to seek the remedy of specific performance of any term contained in the Agreement, or a preliminary or permanent injunction against the breach of any such term or in aid of the exercise of any power granted in the Agreement, or any combination thereof. In its sole discretion, GiveSendGo may elect to issue a warning before assessing damages. We do not represent that materials on the GiveSendGo site are appropriate for use in all locations. Persons who choose to access the GiveSendGo site do so on their own initiative, and are responsible for compliance with local laws, if and to the extent local laws are applicable. Campaign Owners should be aware that many states impose charitable fund solicitation laws to guide direct or indirect fund solicitation activities in those states. While provisions vary state to state, these state laws typically include registration and reporting requirements. We merely provide a technology platform to allow Campaign Owners (Goers) to connect with Givers. Those who access or use the Service do so at their own volition and are entirely responsible for compliance with applicable law. You agree to indemnify and hold GiveSendGo, its officers, subsidiaries, affiliates, successors, assigns, directors, officers, agents, service providers, suppliers and employees, harmless from any claim or demand, including reasonable attorney fees and court costs, made by any third party due to or arising out of Content you submit, post or make available through the Service, your use of the Service, your violation of the Agreement, your breach of any of the representations and warranties herein, or your violation of any rights of another. GiveSendGo is committed to full compliance with all applicable laws and regulations regarding Anti- Money Laundering (“AML”). GiveSendGo’s policy is to prevent people engaged in money laundering, fraud, and other financial crimes, including terrorist financing, from using GiveSendGo’s services. Our third party payment processor Stripe has robust policies and procedures to detect, prevent and report suspicious activity. To comply with OFAC (Office of Foreign Asset Control) requirements, and global sanctions, they screen customer accounts against government watch lists. In addition, they may request that our users provide them with documentation to help prove their identity or for business verification purposes. They will report suspicious transactions to the financial intelligence unit in the respective country. You agree GiveSendGo may provide notifications to you via email, written or hard copy notice, or through conspicuous posting of such notice on our website. You may opt out of certain means of notification or to receive certain notifications. If you have a subpoena to serve on GiveSendGo LLC, please note that GiveSendGo does not accept service via e-mail or fax and will not respond to the subpoena. These Terms are the entire agreement between you and GiveSendGo regarding its subject matter. In the event that a provision of these Terms and Conditions is found to be unlawful, conflicting with another provision of the Terms and Conditions, or otherwise unenforceable, the Terms and Conditions will remain in force as though they had been entered into without that unenforceable provision being included in it. If two or more provisions are deemed to conflict with each other's operation, GiveSendGo LLC, shall have the sole right to elect which provision remains in force. GiveSendGo’s failure to assert any right or provision under this Agreement shall not constitute a waiver of such right or provision. We may amend this Agreement from time to time. When we amend this Agreement, we will update this page and indicate the date that it was last modified. You may refuse to agree to the amendments, but if you do, you must immediately cease using our website and our service. You must visit this page each time you come to our website and read and agree to it if the date it was last modified is more recent than the last time you agreed to the Agreement.